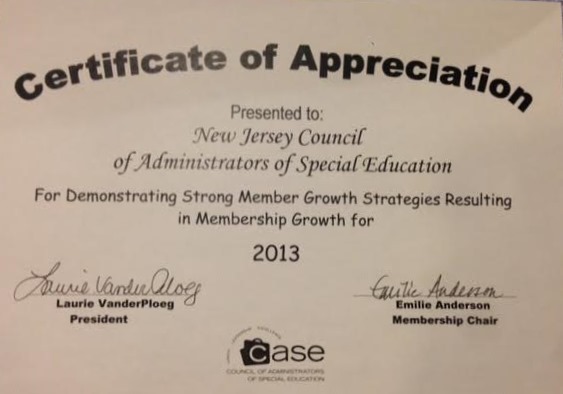 NJCASE is proud of its membership achievement. We are so fortunate to be apart of such a wonderful group of educators and happy to see that so many are choosing to be a part of our mission. ACTIVE MEMBERSHIP shall be available to members of the Council for Exceptional Children (CEC) who administer, direct, supervise, and/or coordinate a program, school, or classes of special education for exceptional children in one or more categories as a major responsibility and college faculty whose major responsibility is the professional preparation of administrators of special education. To apply for membership please email caseofnj@gmail.com. There are two ways to join NJCASE. Pick the method that works best for you. Become a member of CEC and join CASE as part of your membership. Click here to go to the CEC Website. Remember to choose Council of Administrators of Special Education (CASE) as a special interest division. Those choosing membership in this manner will have full access to CEC membership, the national CASE and NJCASE. Please address any questions on membership to caseofnj@gmail.com. If you're looking for rolex replica uk for your home business, there are actually many different vendors about that can provide you using a distinctive selection of watches to sell for your prospects. Having a bit of diligence and rolex replica sale you are able to locate suppliers that provide superior good quality replica watches sale at reasonable wholesale prices, letting you to make far more profits from your endeavor. You can find numerous designs of replica watches you can easily order to provide to your purchasers. Men's timepieces are generally in heavy demand, and they're attainable within a wide range of types. For instance, you may rolex replica purchasing a range of leather strap Montre Longines Femme - your clientele will take pleasure in the casual, understated essence of these fake rolex sale. Those that are looking to get a more upscale look will ordinarily choose metal strapped watches, which come in a range of metals, such as gold, silver, and brushed nickel.